Around the world one book at a time. Rivers of London by Ben Aaronovitch reads like a hybrid between a Doctor Who episode and a police procedural. In a way it’s not surprising since Ben Aaronovitch has written two serials for Doctor Who about Daleks. Rivers of London is the first book in a series by Aaronovitch about police detective/wizard Peter Grant. It doesn’t take the novel long to reveal it’s magic elements to the reader. The first element introduced is the ghost Nicholas Wallpenny. Grant sees Wallpenny while investigating another crime and Wallpennt gives Peter details about the crime. The crime itself has it’s supernatural elements as well. A man seems to appear and disappear without ever being caught on camera. As Peter delves deeper into the mystery he is confronted by the head wizard in the police department, Nightingale, and asked to join as his apprentice. Grant then becomes the first English apprentice wizard in over 70 years. As the apprentice, Peter must practice and hone his magical abilities as well as solve two seemingly unconnected cases. In one case he must find an entity that is possessing people and forcing them to kill, and in the other Peter must make peace between the gods of the River Thames. As the novel unfolds the connection between the cases becomes clearer. I have to say that I really enjoyed this novel. I loved the protagonist, Peter Grant, and the way he interacts with those around him. I did, however, find this novel a bit hard to follow in terms of the plot. It read very much like a TV show, abrupt cuts and all. But whereas in a TV show you have visuals that connect these scenes together, in the book it left me a bit lost. Even with a few plot holes, I would love to read the other books in the series and see what’s next for Peter Grant and Nightingale. Stay tuned for the next installment of Book Battle 2015. Happy reading! Next up in Book Battle 2015 is a book where there author has my same initials. This was by far the most difficult book for me to find. In the end, I could only find two authors who shared by exact initials, B.A. I found so many who were A.B. I considered it for awhile but decided that I wanted to continue with the challenge. 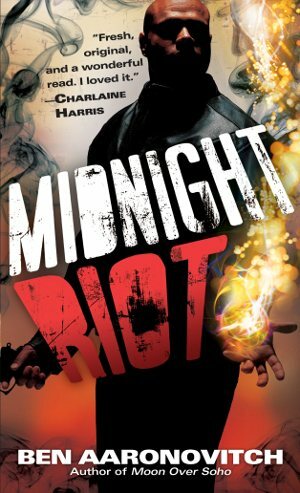 While browsing a bookstore I found Ben Aaronovitch and his novel Rivers of London, also known as Midnight Riot. From the back, this novel is about Peter Grant, a young police detective who finds himself as the apprentice to a wizard working for the London police. While learning magic, Peter becomes entangled in a strange series of crimes somehow based on the Punch and Judy puppets . I must say that I’m extremely intrigued as to how all of these elements are going to fit together. I can’t wait to meet this Peter Grant and see how he solves this series of bizarre crimes. Stay tuned for the full review of Rivers of London. Happy reading!